Winter wonderland weddings can be elegant. The themes for a winter wedding can be beautiful and elegant, but not necessarily predictable. There are many fun seasonal themes bridal couples can choose if they plan to celebrate their nuptials during the snowfall season. Choosing the right theme will allow you to coordinate decorations, wedding stationary, attire, colors, and other aspects of your wedding into a beautifully matched event that will be tasteful, memorable, and gorgeous. Fortunately, there are many outstanding winter themes that can be easily personalized. Christmas: A Christmas or holiday theme is the most common for winter weddings. Red and green attire, Mr. and Mrs. Claus figurines, ornament favors, and lighted trees are popular elements for a Christmas wedding theme. Ice Blue: Embrace your something blue with an ice blue wedding theme. Light blue and silver is an elegant color combination, and crystal accents to wedding decorations can add glitter and glamour to this wedding theme. White Wedding: Choosing an all white wedding is perfect for winter when the landscape itself will coordinate with the theme. White bridesmaids' dresses and tuxedos, an all white wedding cake, and an elegant white bridal bouquet are stunning details for this simple theme. Winter Wonderland: Couples can celebrate their union in a winter wonderland if they choose snowflake decorations and icy accents. Winter Sports: An athletic couple may choose a skiing, ice skating, or snowboarding wedding theme to show off their personalities, followed by a fun honeymoon to a ski resort or other winter destination. Jack Frost: This whimsical wedding theme focuses on winter fairies and fun ice shapes that add a touch of humor to a chilly season. Royal Russia: Princess weddings can happen in the winter when couples choose a royal Russian wedding theme. A Cinderella wedding gown, white fur muff, and Russian-inspired menu can make this dream theme a reality. Jingle Bells: Instead of classic wedding bells, couples can add a seasonal twist by choosing jingle bells as their wedding theme. Bell decorations and favors are easy to find in early winter and are a creative, fun choice. Winter Animals: Another whimsical option for winter wedding themes is to choose winter animals as the focal point. Polar bears, penguins, and huskies are popular choices and can be found in wedding cake toppers and other fun accents. Poinsettia: A simple poinsettia wedding theme is an elegant and colorful option for winter weddings. Available in many colors, poinsettias are lovely plants that add a hint of holiday cheer to any winter wedding. The bride can carry a poinsettia bouquet and these flowers make excellent centerpieces. New Year's: New Year's Eve is a popular winter wedding date, and couples can add a countdown theme to their wedding décor with different clocks, dropping their own crystal-studded ball, or sharing party hat wedding favors with their guests. Valentine's Day: This late winter holiday is another popular wedding date. A Valentine's Day wedding theme may embrace a heart or cherub motif, red or pink roses, nostalgic candies, or other classic Valentine's Day symbolism. Winter themes can be fun to plan and decorate, and the little details of a well coordinated wedding can make it especially memorable. 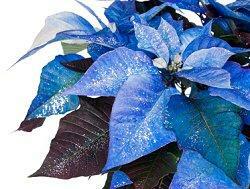 Let a rare poinsettia be your something blue. Choose crystal accents for the wedding dress and decorations to simulate the sparkle of snow and ice. Consider ice sculptures, bowls, or vases as part of your wedding decorations. Arrange a sleigh as transportation between the wedding ceremony and reception sites. Offer your guests warm drinks such as cocoa, hot eggnog, spiced cider, mulled wine, or exotic coffees. Choose winter wedding favors such as candy canes, mittens, ornaments, or other seasonal trinkets. Opt for a cool mint wedding cake or snowball white chocolate wedding truffles as a delicious treat. While the decorative details are important for a winter wedding, be sure to attend to the comfort and safety of yourself and your guests as well. Choose a winter wedding dress and bridal party dresses that are suitable for the season with heavier, warmer fabrics and longer sleeves. Choose safe wedding shoes that will be easy to walk across potentially icy paths and stairs. Have a coat check available for your wedding guests so their outer clothing can be kept safe during the ceremony and reception. Be sure all ramps, stairs, sidewalks, and pathways are clean and clear of ice before the wedding, and have someone check them periodically during the reception to ensure they do not become treacherous. Be aware that unpredictable winter weather can wreak havoc with travel plans and be as flexible as possible with your wedding details. Winter wedding themes range from classically simple and elegant to whimsical and fun. Whatever theme you choose, by using it to coordinate the look of your wedding you will have a beautiful and memorable event that will warm your heart with romance no matter what the temperature is outside.